A light bulb that lasts 22 years? No, that is not a typo. 22 years. It's here! Isn't it amazing how far we are advancing technologically? The latest in lighting technology is the Insignia 800-Lumen, 13-Watt Dimmable LED Light Bulb. 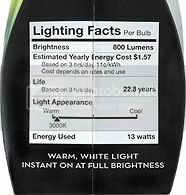 I had the opportunity to review these bulbs and I was very surprised by not only how long it lasts, but also how well it performs. I wasn't sure how the light would look with this bulb. But the Insignia NS-LED60F 13-Watt dimmable LED light bulb offers a warm white light equivalent to a standard 60-Watt incandescent light bulb. It is a beautiful and bright color. Not only does the omnidirectional design provide uniform light distribution ideal for table lamps, open ceiling, and wall fixtures; it also uses 75% less electricity. 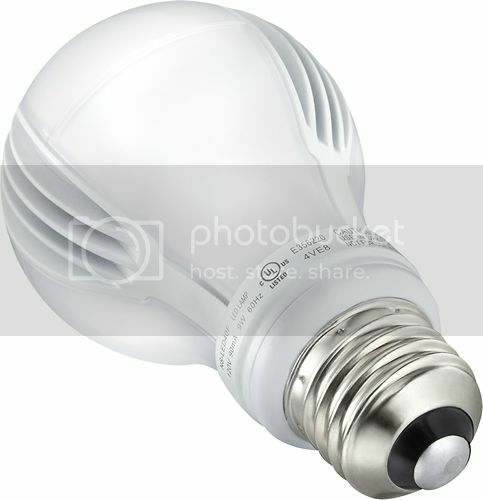 Don't forget as mentioned, this LED light bulb will provide you light for more than 22 years. Think green! It creates 98% less waste than traditional lighting options (fully recyclable – contains no mercury, filament or glass). It is really pretty much amazing. Lasts more than 22 years. Less frequent replacements and more cost savings. Uses only 13 watts of power: Over 75% savings in electricity usage compared with a 60-Watt incandescent light bulb. Instant On: Lights up instantly at full brightness. 800 lumens of brightness: Provides same amount of brightness as a 60-Watt incandescent bulb. Omnidirectional design: Distributes light evenly. Dimmable bulb: Adjust the brightness to a desired level using leading dimmers (not included). Mercury-free design: Unlike CFL bulbs, this bulb uses no Mercury. Standard Light Bulb Shape: Similar size and shape as a standard A19 incandescent bulbs, providing for easy change overs. 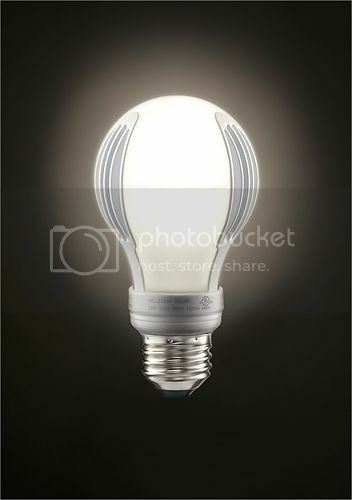 Light Appearance: This frosted white plastic bulb casts a warm white glow at 3000K. Why not give them a try using the special offer coupon below? I am confident that you will be as impressed as I was! Buy It :: You can purchase Insignia LED light bulbs in stores or online at bestbuy.com on or after October 28 for $16.99 for a 60-watt equivalent and $13.99 for a 40-watt equivalent. SPECIAL OFFER :: Click HERE to get a special coupon for Buy Two, Get One 50% off! This coupon is only valid 10/28/12 - 11/10/12 for use in Best Buy stores. The reviewer has been compensated in the form of a Best Buy Gift Card and/or received the product/service at a reduced price or for free. See my full disclosure.